Are you looking for a great racing game to play? 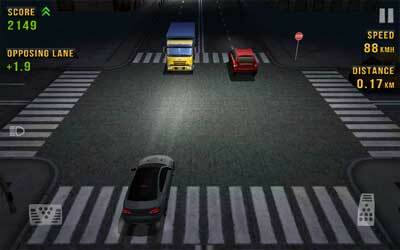 If you are, Traffic Racer APK 2.3 could be a coolest reference for you. What makes this racing game special than others is the genre of which is categorized as endless arcade racing that offers 5 game modes as once. Playing this game could be really outstanding because you are able to drive the chosen car that you love in the middle of traffic highway. While playing this incredible racing game, you are even able to earn money to be used for upgrading your car and also buy the new car to ride. Supported by amazingly high definition graphics in 3D, you will have the stunning racing experiences while playing the game. Besides, other interesting features are also designed incredibly for this game, so you are able to enjoy the realistic and smooth car handling as well. In addition, you are able to choose more than 35 different car types to be chosen according your taste to be driven along the challenging highway traffic. Furthermore, this fantastic racing game even could be played by you without overwhelming yourself since all you need to do is just tapping the screen on your devices. The tips you should know how to be the winner while playing this game is by keeping driving as faster as you could for earning the bigger scores. Do not forget to drive swiftly and switch driving to slow speed for getting the available cash and other bonuses on the highway while driving. Besides, driving in reverse direction through two-way game mode will let you get extra cash and score as well. The latest update version of this game was already available at Google Play since March 8th 2016. After getting the installed game in your device updated, you are even able to enjoy the renewed features including the better graphical for some car models. So, are you ready to be the best racer through playing the awesome Traffic Racer for android, then?